Shadow being taken over by a spirit. 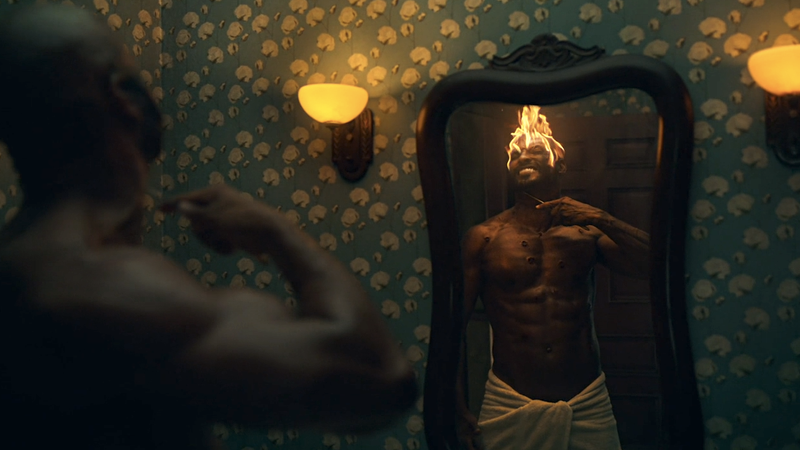 Though the scene wasn’t part of the original novel, the lynching that takes place in the very first episode of Starz’s American Gods was a statement from showrunners Bryan Fuller and Michael Green about the kind of story they wanted to tell—one where reflections on the horrors of the transatlantic slave trade become beautiful pieces of oration and lynchings are presented as grotesque works of art. But as the season went on, Shadow’s lynching went largely unaddressed, and in moving on from the moment, American Gods proved that it was willing to tap into powerful, painful imagery without doing to work to make sure that audiences understood the showrunners were handling the associated ideas with care. With the show’s second season and a new showrunner came the hope that American Gods might have learned from its freshman mistakes. Last night’s episode—“The Ways of the Dead”—showed that, unfortunately, that’s not the case. Before we learn Will James’ name or anything of substance about the man he was or the life he lived, “The Ways of the Dead” chronicles the events leading up to his death on the fateful day he had the misfortune of crossing paths, and allegedly making eye contact, with a white woman. Like Emmett Till and countless other black men like him, James’ very presence in public spaces and his willingness to walk freely—as is his right—so incenses his town’s population of racists that it takes nothing for them assume that he’s the culprit when the white woman turns up dead one morning. Without any sort of trial or investigation, James is dragged through the streets as the town of Cairo, Illinois marvels and cheers at his impending execution. James, for his part, resigns himself to the fact that all things die. Emily Browning in American Gods. Because “The Ways of the Dead” doesn’t (and can’t, really) delve into any of those ideas in a substantive way, its depiction of a lynching becomes an extension of the spectacles that lynchings are. In more skilled hands, the episode could have possibly been the kind of subplot that better reflected American Gods’ understanding of the difficult position that the show’s black gods have always found themselves in, given the plight of black Americans. But instead, it ends up feeling like a twisted version of the Mike Ainsel plot from the novel that revels in images of black suffering. The Jinn, Salim, and Wednesday driving through America. It’s a shame that “The Ways of the Dead” is built around such a fraught and mishandled centerpiece because, on the whole, the rest of the episode is quite good. Perhaps not season one good, but certainly operating with a newfound rhythm and pattern that makes the show’s characters delightful to watch to interact. As Shadow’s having his crisis of faith in Cairo, Salim’s struggling to reconcile his love for the Jinn with the Jinn’s distaste for Salim’s unwavering faith in one god. Despite all of the literal gods Salim’s encountered during his travels with the Jinn, he’s resolute in his commitment to Allah, which amuses Wednesday and perturbs the Jinn. Even though American Gods has nodded to the idea that the deities of the world’s major monotheistic religions have no real need to become involved in Wednesday’s war, it’s interesting to see the show focus on one mortal’s personal relationship to a god who, for the purposes of the show, isn’t likely to manifest physically the way other gods do. Like his relationship with the Jinn, Salim’s faith is a personal, complicated thing that’s built on his own connection to god, which is something that none of the other magical beings at all factor into. Salim understands that other beings who are gods exist, to be sure, but for him, God is a singular concept who both is and isn’t part of the world he’s found himself in. 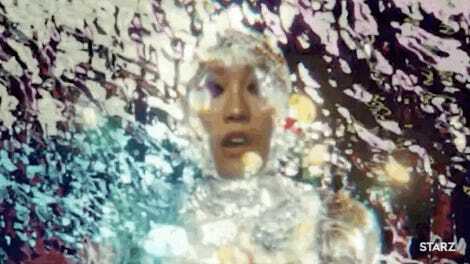 In a not altogether different way, the episode continues to unpack the more personal relationships between gods and humans in the new connections Bilquis is making with the people of Cairo who, following the murder of another member of the Goodchild family, are once again in mourning. Gruesome as it is to think of, it’s implied that James’ curse on Cairo is part of what’s bonded Cairo’s black community together. Bilquis sees that in moments where violence strikes, everyone in the town is brought together in solidarity, but she also understands that their plight is the direct result of other gods’ actions. There’s no reason she can’t step in and offer them something different—another kind of spiritual lighting rod that could draw them all together.